Double-hemisphere world map pre-dating the discovery of Australia and Antarctica, and with an unusual depiction of New England. The first state of this map appeared in an edition of Ptolemy's Geographia published by Girolamo Ruscelli in Venice in 1561. 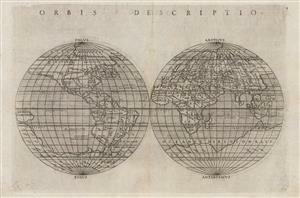 It is the earliest known example of a double-hemisphere world map being published in an atlas. This later second state appeared 25 years later in Giuseppe Rosaccio's 1598 and 1599 editions of the Geographia. Rosaccio amended Ruscelli's original map by adding a large, unknown Southern continent, the mysterious Terra Australis Incognita.